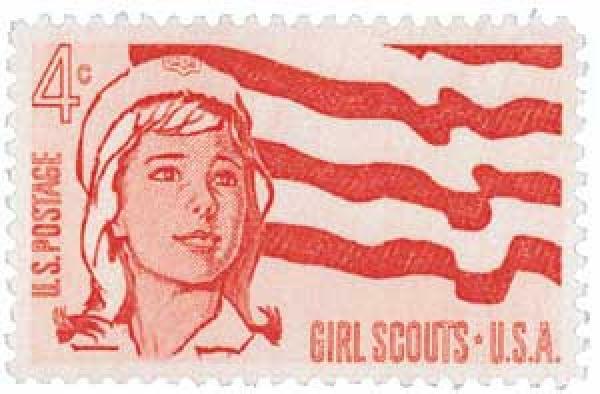 U.S. #1199 – Girl Scouts 50th anniversary stamp. On March 12, 1912, Juliette “Daisy” Gordon Low held the first meeting of the Girl Guides, the forerunner of the Girl Scouts of the United States of America. Scouting groups were first started in England in 1907, when Lord Robert Baden-Powell began the Boy Scouts movement. When girls became interested in belonging to a similar group, he helped his sister Agnes Baden-Powell organize the Girl Guides program. Scouting quickly spread to other countries. 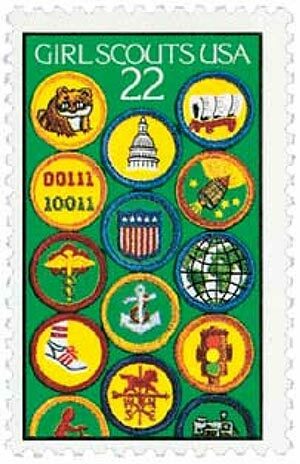 U.S. #2251 – Issued on the Girl Scouts’ 75th anniversary. A British Boy Scout helped American businessman William D. Boyce find his way in London’s fog. When the boy refused his tip, telling him he was merely doing his “good turn” for the day, it left an impression on him. So Boyce then worked with others to found the Boy Scouts of America in 1910. The Handbook for Boys was published that same year. 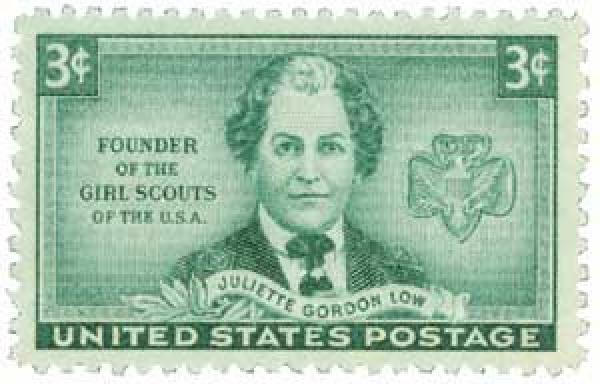 Some of the Scouts’ early contributions to their communities and their country were made to support Americans during World War I.
Juliette Gordon Low was a member of a prominent family in Georgia. Following the death of her husband, Low traveled to Europe in 1911 and met Sir Robert Baden-Powell and his sister Agnes. Low had long dreamed of an organization that would get girls out of their houses to experience the outdoors, while learning important skills to make them self-reliant and resourceful. 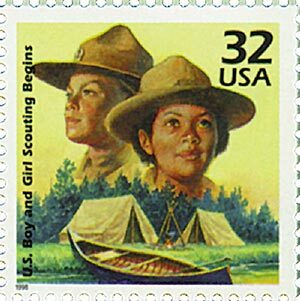 U.S. #3183j – Scouting stamp from Celebrate the Century series. That August, Low began working with Agnes and the Girl Guides, and eventually formed a Girl Guides patrol near her home in Scotland. She taught the girls how to spin wool, care for livestock, tie knots, and read maps. She also taught them knitting, cooking, and first aid. Additionally, she had her military friends teach them about drilling, signaling, and camping. 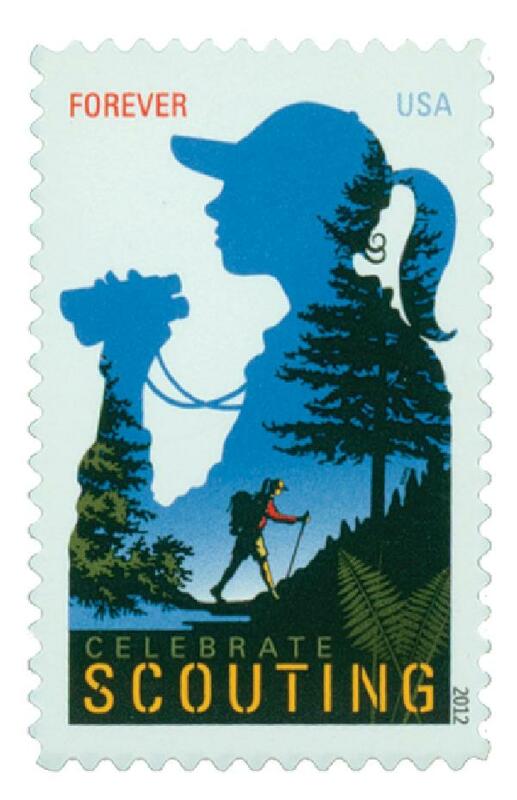 U.S. #4691 – Girl Scouts 100th anniversary stamp. The first registered member of the American Girl Guides was Margaret Gordon, Juliette’s niece. Low’s first Girl Scout meeting included 18 girls, but by the next meeting there were 108 girls enrolled. By 1915 the organization had grown to include 5,000 girls. Because of the quickly growing numbers of girls, the organization was divided into three groups according to age. Today, there are even more groups. These levels are “Daisies” for the youngest girls (5-7 years old), “Brownies” (7-9), “Juniors” (9-11), “Cadettes” (11-14), “Seniors” (14-16), and finally “Ambassadors” (16-18). Low was so committed to Girl Scouts, she sold her pearls to help support it. Later, 25¢ national dues were adopted to help support the organization. U.S. #974 was issued in Juliette Low’s hometown of Savannah, Georgia. During World War II, Boy and Girl Scouts were actively involved in selling U.S. Defense Bonds, growing Victory gardens, and collecting waste fats (to make ammunition) and scrap metals. In addition, they learned a wide variety of skills while earning badges. 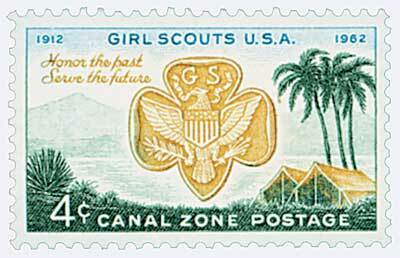 U.S. #CZ156 – Canal Zone stamp marking 50th anniversary of the Girl Scouts. This entry was posted in March 2016, This Day in History. Bookmark the permalink. 5 Responses to "This Day in History… March 12, 1912"
Great article- very interesting. Yeah, also love the cookies. Besides the GREAT COOKIES don’t forget that the girl scouts were quicker to discard the homophobic curse against gay women and girls in the girl scouts that so long hampered the boy scouts. Wanting to help children to grow up and accept themselves and others regardless of differences should be part of any program designed for young people. I applaud the Girl Scouts of America for their recognition that different is not bad. Have seen the home in Savannah where they were founded. Ironically, a box of cookies today before I read this. What an interesting and informative article. A bit of history about this wonderful organization. Keep up the good work Mystic. This site is such a treasure.